Sadly I’m running low on the classics department for fragrances earlier than the 80s. When I first started doing these reviews, I was skeptical about how good the old classics could really be. And sure enough, I fell in love with the old perfumes. Ming Shu, on the other hand, isn’t even that old of a fragrance, but even it has been toned down. In Bottle: Very floral, the water lilies are making quite a loud entrance. Applied: Funny that the peach doesn’t factor into this at all because I immediately get water lily. Lots and lots of water lilies. They’re slick and floral and fresh. In fact, they’re a bit too fresh and a bit too loud. It’s like I can hardly focus on anything else because Ming Shu is cramming water lilies into my nose. The cedar note comes in a bit later, but cedar to me as always been a bit heavy-handed and it only serves to add to the loudness of the water lilies here. I’m not a fan of this, unfortunately. There’s only about two notes to my nose and neither of them are getting along with me. They end up too overwhelming to me, and too basic at the same time. Extra: Ming Shu was released in the late 90s. This version and it’s other iterations are a little tricky to find, but not impossible. Design: Bottle in a pagoda inspired style. I’m not sure how much I embrace this kind of design as the bottle on the one hand looks like a pagoda, and on the other it looks like a pylon or traffic cone. Perhap’s it’s both. I’m not a bit fan of the design. Notes: Peach, water lily, cedar, musk. Another fragrance casualty of the toning down movement. Ming Shu in the 90s was reportedly a much nicer, much more complex, much more likable a fragrance than it is now. 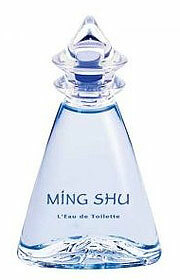 Reviewed in This Post: Ming Shu, 2011, L’Eau de Toilette. This entry was posted in floral, fresh, Reviews By House, yves rocher and tagged cedar, musk, peach, water lily. Bookmark the permalink. THIS IS SOME GOOD PARFUME.I USUALLY GET IT FROM YVES ROCHER.BUT THEY NO LONGER CARRIES IT.IF YOU FIND SOMEONE WHO’S SELLING IT.EMAIL ME PLEASE. MRS. VIELLA JOSEPH.